When it comes to the value of repeat customers, you’ve heard it before (and you’ll hear it again). Repeat customers are easier to sell to and they often spend more money than new customers. In fact, it can cost 5 times more to get a new customer than to keep an existing one. Of course, the stats on repeat customers will vary by industry, your business, and even your location. But this doesn’t change the fact that repeat customers are good for your bottom line. Despite this common business knowledge, many small businesses focus all their marketing and advertising efforts on acquiring new customers. Don’t do this! Finding new customers will always be important, but if you want to grow your business, make sure you also market to your existing customers. You want to get repeat customers, so you’ll have to talk to your existing customer base. But how do you do this? For starters, you should be collecting all your customer information in a CRM. When you’re collecting all your client information in a CRM and maintaining good records, it becomes much easier to talk to your existing customers and offer new services. Once you’re set up with a good CRM (like Jobber) and you have good customer information, it’s time to talk to those customers. If your business is seasonal, you can market your services to customers from the previous season. Keep a list of customers, and the services they’ve booked in the past, and reach out to them with promotional offers for the new season. This report will give you a full list of past customers that you can reach out to, and you know they are a good candidate for your services because they’ve required this service in the past. Getting your customers to book your services in advance is a great way to build a predictable schedule. A predictable schedule can reduce administrative headaches and help you predict company revenue in advance—2 great things for any service business! If you offer any recurring or maintenance work, encourage your customers to book in advance by offering a small discount. Residential cleaning companies often have extra requests around the holiday season. Weed control and pest control companies are often seasonal in nature and offer maintenance packages for customers. In all of these instances, reach out to customers and encourage them to book services in advance by offering a small discount. Last year you took advantage of our Summer Weed Control Package. This year, we’re offering a special discount to customers who book in advance. When you book your Summer Weed Control Package before the end of March, you’ll save 10% on this year’s services. Please reply to this email or call our office at 1.888.721.1115 to book your summer maintenance package today! Inevitably, a lot of your work will be one time jobs. Are there opportunities to turn these one-off jobs into repeat business? A one-off cleaning appointment can turn into a regular monthly cleaning. An initial appliance repair visit or install can turn into a maintenance contract. A spring cleanup for a lawn care company can turn into weekly visits. Send your customers an email when this initial job is complete and let them know about your ongoing service packages. 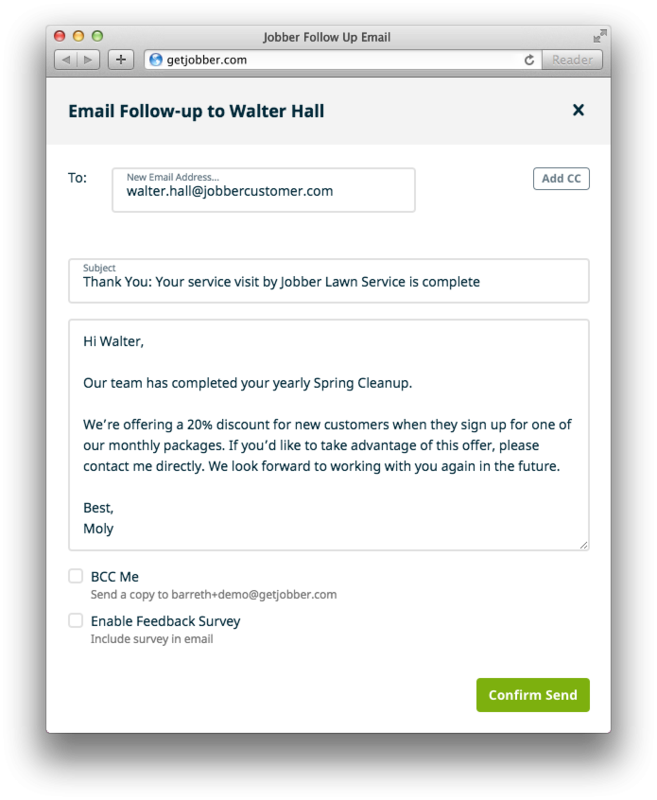 Jobber makes it easy to send client follow up emails as soon as a job is complete. If you aren’t currently marketing to your existing customers, don’t worry, it’s never too late to start! 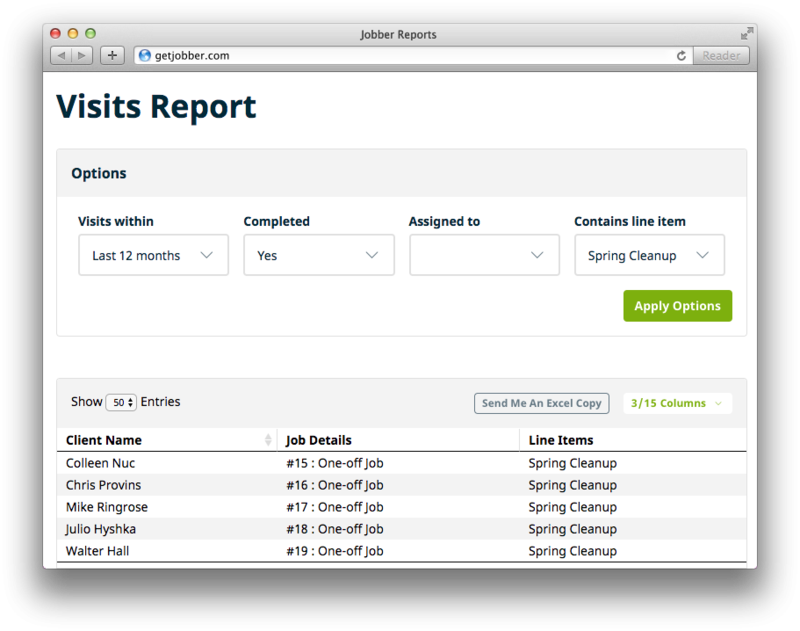 Keep track of your customers in a CRM and leverage reports and other tools to help you stay in touch with your customers. Your customer service will stand out and your business will grow.